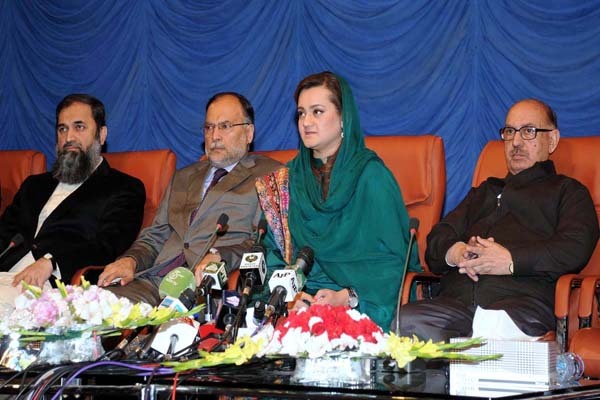 ISLAMABAD, Dec 19 (APP): Minister of State for Information, Broadcasting and National Heritage Marriyum Aurangzeb on Monday said the government under the leadership of Prime Minister Muhammad Nawaz Sharif was taking steps to transform Pakistan into a real Islamic welfare state as envisioned by Quaid-e-Azam Muhammad Ali Jinnah. Speaking here at the opening ceremony of week-long celebrations of Quaid-e-Azam Muhammad Ali Jinnah’s 141st birth anniversary, the minister said the grand celebrations were being held to educate youth about the Quaid’s vision and Pakistan’s ideology. She said the prime minister during a meeting almost a month ago had issued directives for celebrating the Quaid’s birth anniversary in a befitting manner and her ministry was playing a leading role. The theme of celebrations was ‘Quaid ka Pakistan’ (Quaid’s Pakistan), she said adding that the activities, among others, would include a painting competition of Quaid’s image, speech and quiz contests on the Quaid’s life, puppet shows and tableaus by different groups of children, besides singing competitions of national anthem and songs. Marriyum said the people could participate in a cake cutting competition on the occasion of the Quaid’s birth anniversary by uploading their pictures on twitter and facebook accounts and the winner would get a cash prize of Rs 100,000. The people could also share pictures or memorial things related to the Quaid, she added. The minister said the prime minister would also join the youth, political parties, business community and minorities in the Quaid’s birthday celebrations. She said a cultural Mela (festival) had been opened for general public at Lok Virsa to mark the occasion and all the media houses had been invited to highlight the theme of the week-long celebrations. Minister for Planning, Development and Reforms Ahsan Iqbal, Adviser to the Prime Minister’s on National History and Literary Heritage Division Irfan Siddiqui, Minister of State for Capital Administration and Development Division (CADD) Tariq Fazal Chaudhry and Minister of State for Education, Training and Standards in Higher Education Balighur Rehman also attended the ceremony. Speaking on the occasion, Minister of State Dr Tariq Fazal said alive nations always kept remembering their heroes. The Quaid week’s celebrations were very important and his ministry would fully participate in them, he added. Islamabad Mayor and Capital Development Authority (CDA) Chairman Ansar Aziz Chaudhry said the Islamabad Metropolitan Corporation and CDA would play their due role in the Quaid week celebrations. Engineer Balighur Rehman said today Pakistan was making economic turnaround at a rapid pace with reduction in power loadshedding. Side by side the material progress, there was need to remain attached with the country’s ideology, he added. He said the National Curriculum Council had been constituted to devise minimum national curriculum. He said his ministry and the Higher Education Commission would actively participate in Quaid week’s celebrations. Later the ministers and adviser inaugurated an exhibition of rare pictures of the Quaid-e-Azam at the PNCA Gallery.